Couples in love searching for a destination photographer love working with Christopher Todd Studios. Because of his calm deamenor couples are at ease in front of the camera. This photo was taken at the iconic bean in Chicago. Hannah and Brian are from Orange County but met and live in Chicago. So when they booked me for their wedding in Southern California we decided an engagement session where they currently live would be really unique. We discussed the type of photos this engaged couple wanted prior to the day. We mapped out all the locations we decided on. We did have to track the weather as rain was forecasted for the later part of the day. Knowing that it would rain we took advantage of it for some romantic engagement portraits. See here for those photos. 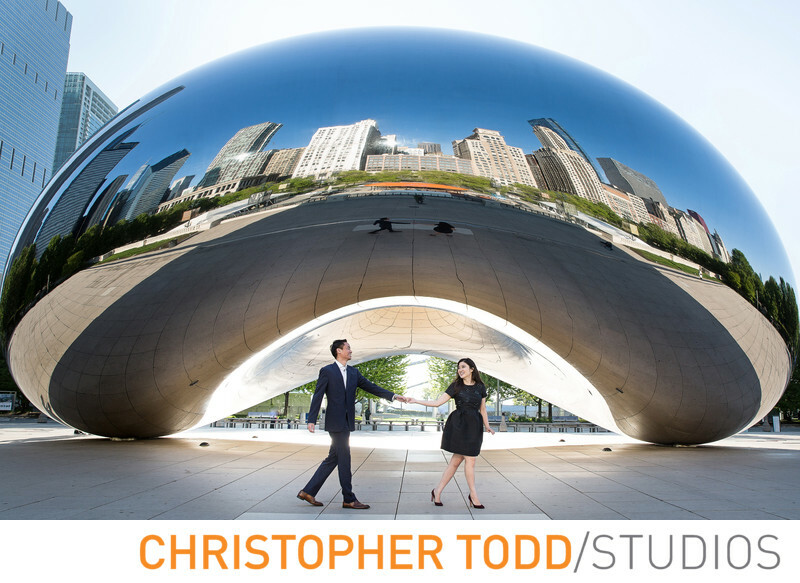 Want Christopher Todd Studios to photograph your engagement photos? We would love to talk about your session. Location: 201 E Randolph St, Chicago, IL 60602. 1/200; f/7.1; ISO 200; 24.0 mm.